A “comprehensive…fascinating” (The New York Times Book Review) history of Asian Americans and their role in American life, by one of the nation’s preeminent scholars on the subject. In the past fifty years, Asian Americans have helped change the face of America and are now the fastest growing group in the United States. But much of their long history has been forgotten. “In her sweeping, powerful new book, Erika Lee considers the rich, complicated, and sometimes invisible histories of Asians in the United States” (Huffington Post). The Making of Asian America shows how generations of Asian immigrants and their American-born descendants have made and remade Asian American life, from sailors who came on the first trans-Pacific ships in the 1500 to the Japanese Americans incarcerated during World War II. Over the past fifty years, a new Asian America has emerged out of community activism and the arrival of new immigrants and refugees. No longer a “despised minority,” Asian Americans are now held up as America’s “model minorities” in ways that reveal the complicated role that race still plays in the United States. Published fifty years after the passage of the United States’ Immigration and Nationality Act of 1965, these “powerful Asian American stories…are inspiring, and Lee herself does them justice in a book that is long overdue” (Los Angeles Times). 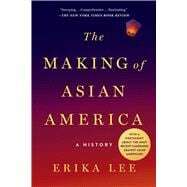 But more than that, The Making of Asian America is an “epic and eye-opening” (Minneapolis Star-Tribune) new way of understanding America itself, its complicated histories of race and immigration, and its place in the world today.